Alesis has done a fine job with the Command Mesh. The pads alone make it a worthy contender, while the range of sounds on offer followed by the sample playback option make this a kit that will take a long time to outgrow. A superb price for a mesh kit. 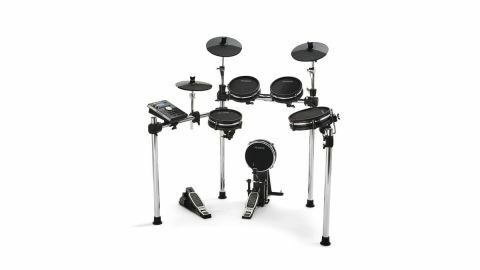 The electronic drum set market used to be pretty much a two-horse race, with Japanese giants Yamaha and Roland both the first names that sprang to the minds of many potential e-kit customers. However, in the last decade or so, this part of the drum market has become a battleground - particularly in the entry and mid-price range, with plenty of generic options available at competitive prices. One company that has stuck out as a serious contender is Alesis, offering more than just ‘me too’ products, it has fast become the third name on the ‘e-drums you can trust’ list. And for good reason too, its pedigree has provided us with affordable electronic music gear ranging from the 3630 compressor to the SR16 drum machine, so it should be no surprise that the company has harnessed this ability when approaching electronic drums too. This year sees the existing Command kit refined to include mesh pads to offer a greater playing experience. Let's take a look. The Command Mesh sits between two other kits in the Alesis line-up to feature all-mesh pads: the Surge, and Alesis’ premium offering, the Strike. It follows a standard five-piece- plus-cymbals kit configuration, with three 8" tom pads, a 10" snare pad and an 8" bass drum pad, which also uses a mesh head. The snare and tom pads are all dual-zone, meaning that separate sounds can be assigned to the head and rim of each pad, offering up to eight different voices from these pads alone. There are three 10" cymbal pads (ride, crash and hi-hats) plus a hi-hat controller pedal. Included in the box is a sturdy 1 1⁄2" tube rack system, similar to that found on kits from Roland and Yamaha - and a bass drum pedal. Other features include a USB MIDI connection, to enable you to easily record MIDI data into a computer - plus standard MIDI in/out sockets, 3.5mm headphone and auxiliary input jacks, expansion pad inputs for an additional tom and cymbal pad. To the side of the module sits another USB socket, allowing you to connect a memory stick containing jam tracks or samples. As with other brands, Alesis supplies the rack for the kit in a ‘flat pack’ style, so the first job is to build it. This is tedious, of course, but fairly unavoidable, and made easier by the included photographic guide. The Command module is a sleek-looking piece of kit, and certainly sets itself apart from more off-the-shelf modules. Central to controlling everything is the large rotary control in the middle, and as is common, navigating through preset kits is easy, while delving deeper to edit sounds will require a bit more weaving through menus using the cursor buttons. Each voice in the kit is selected by hitting the relevant playing surface, and then adjusting parameters such as volume, decay time, pitch, reverb etc. We’ve encountered better-looking displays, with slicker interfaces and simpler navigation, but it’s really not difficult once you get used to tapping through the options. The sounds within the module follow the overall feel of the rest of the kit: it’s safe, with everything you need. Acoustic kits range from studio all-rounders to samples of brushed jazz kits, taking in rock, funk and ‘power’ style sounds along the way. Meanwhile, the expected electro standards are present too: snappy snares, hand claps, 808 kicks and Simmons-style toms are there too. It’s loaded with percussion, and there’s a surprising amount of tuned percussion - made more playable by the number of playing surfaces included with the dual-zone pads. With some tweaking it’s possible to tease pretty much every kind of sound you need out of the raw samples, making it very well suited to playing different styles. This can be done by connecting your phone (or any device for that matter) to the 3.5mm aux input, or by plugging in a USB memory stick. As we mentioned above, the USB feature also allows you to import your own samples and assign them to a pad, which unlocks a world of creative possibilities. There are a few caveats, though. The manual states that this function will work with a USB stick ranging from 4-64GB (although our randomly selected 2GB drive worked just fine), and it must be formatted to DOS Fat 32 (easily done on your computer). As well as this, the samples have to be wav format, and must also be mono, so there could be some possible editing required in order to get your sounds to work. Assuming the above, placing the USB stick into the module creates a set of folders, and as long as the sounds you want to trigger are placed in the ‘Samples’ folder, they will be visible on the module’s screen when viewing the USB menu. You select the file, import it into the module, then scroll to the start of the sound list and assign it to the pad of your choice. While all this sounds a bit fiddly, once you have the correct format, it’s a lot of fun, and could make the Command a useful hybrid brain for live as well as home use. The Command Mesh isn't without its limitations - it's a reasonably-priced kit that provides a decent level of functionality and features out of the box. The hi-hat control feels springier and has a boxier look and feel to our Roland model, but the travel is adjustable and we had no problem getting it to open and close at a natural-feeling distance. The inclusion of a 'proper' bass drum pad, as well as a sturdy pedal, rather than a space/noise-saving trigger is a positive for first-time e-kit buyers, or those looking to move between acoustic and electronic kits too. We did find that the mounting hardware was prone to moving a little under heavier strikes unless tightened very securely, and the rubber rim shrouds made tuning with the included key a bit fiddly. With all that said, these are minor grumbles, rather than anything that is likely to stop you enjoying the kit. A quick scan of your favourite online retailer's website will reveal that while there's no shortage of electronic kits on the market, there aren't many boasting this level of features, complete with mesh heads. Yes, dual-zone cymbal pads would be a 'nice-to-have', particularly for developing ride voicings, but this kit is built to hit a price point, and at no point did we feel like we were playing a lower-priced compromise. The end result is a solid, if not massively surprising set of sounds as a competitive package.